If you’re looking for a commercial vegetable farming business of your own, but confused how to start it then we can help you with this concern. The purpose of producing vegetable is to consume by human beings. As vegetable growing is a practice, it began in several parts of the world more than ten thousand years ago. Although humans could only grow vegetables via manual labor at an early age, when civilization came, livestock was domesticated and used to plow the farms for vegetable plantation. And nearly all vegetable farming processes are automatic in the recent time. Also, specialist farmers tend to cultivate the vegetables so that the crops those are genetically ready to doing well in their environment. And vegetable farming is one aspect of farming with the ability to generate income and profits year-round in Bangladesh. 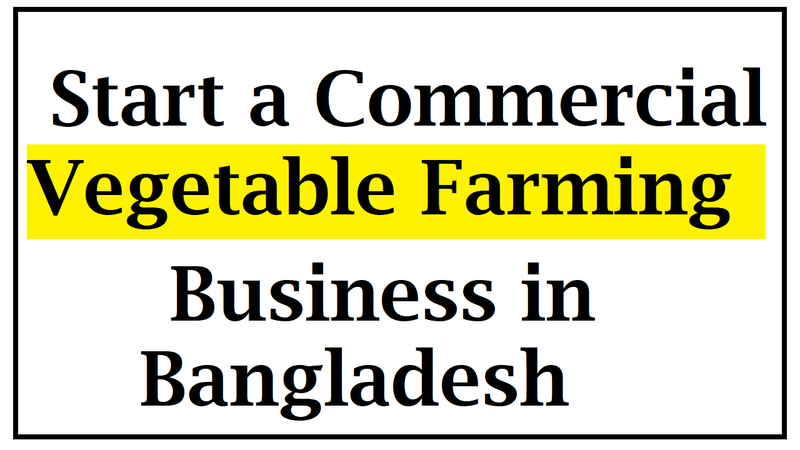 Why Start a Commercial Vegetable Farming Business in Bangladesh? Commercial vegetable farming is one of them as there are a lot of business opportunities available surely. And you may be paying attention as an aspiring entrepreneur in the agricultural sector of your country. Also, the good news is that you cannot get it wrong if you’re considering starting a vegetable farm. As various types of vegetable are consumed by almost everybody all over Bangladesh, you have a great chance to be successful. Although it’s important to state that starting a vegetable farming business comes with its own share of challenges, it does not rule out the fact that it’s certainly a profitable business venture. Besides, Bangladesh is a country with more than 160 million people, which is the great extra point in favor of this business. Depending on their financial status, an aspiring entrepreneur can either choose to start a vegetable farm on a small scale or on a large scale. You should ensure that you carry out thorough feasibility studies and market survey if you have decided to go into vegetable farming business. When launching your own vegetable farming business, a business plan is yet another very important business document that you should not take for granted. Apart from a business plan, there are many other steps. Well, let’s know what the other steps to start this vegetable producing business. As a farmer, you must consider the fact that most vegetable crops are highly perishable. Also, you would therefore first need to develop suitable markets for his produce, even before he starts vegetable cultivation. Because of the absence of market development, most startup vegetable operations for the most part flop. There is the need to first develop a line of middlemen who will ensure that his produce gets to the selling point on time for a vegetable grower who is keen to succeed. You must then embark on proper field selection when the market for the product has been well thought out and developed. Also, you must take into consideration field topography, soil type, and water availability and quality when considering sites for the purpose of cultivating vegetables. While water availability refers to the ease to which water can be accessed, soil type refers to the physical composition or properties of the soil. And as this should be accounting for during site selection, vegetables usually need more water than most other agronomic crops do. When going into commercial vegetable farming another important factor to consider is crop and variety selection. It’s a high incidence of disease outbreaks, which is the greatest limiting factor to successful vegetable production from a pest stand-point. So, if you want to greatly increase the chance for success then it’s a great need to cultivate mainly disease resisting species. As they are operating from must be ready and willing to utilize every available means, any business that wants to grow beyond the corner of the street or the city. This is the way to advertise and promote the business. Consider advertising on both print (newspapers and magazines) and electronic media platforms. Commercial vegetable farming has its own challenges as with any other venture undertaken by man. Among others, the first one is a vegetable glut, a condition of many farmers mature and is brought to the market at the same time. When drives down the price of vegetables considerably this occurs. And a farmer at this time has to sell at whatever price he can get in order to avoid total loss since they are quickly perishable. Another one is preservation as one of the major problems. And in order for vegetables to last for longer one way to avoid glut is preservation.